February 21, 2019 - DUBAI, UAE -- Under the patronage of His Highness Sheikh Hamdan Bin Mohammed Bin Rashid Al Maktoum, Crown Prince of Dubai and Chairman of Dubai Sports Council, Dubai will host its first International Master Competition for RC Aircraft from February 23-27. Supported by Dubai Sports Council, the Dubai Masters RC Championship will take place at the Skyhub RC Campus in Al Lisaili on the Dubai-Al Ain Road, with elite professional pilots from around the world taking part. The competition will take place in four categories - International Category Helicopter, Gulf Category Jet Aircraft, Gulf Category 3D Aircraft and Gulf Category Helicopter – and more than 70 pilots representing 20 countries will be taking part. Nasr Hammouda Al Niyadi, Head of the Organising Committee and Chairman of the Emirates Federation for Air Sports, thanked HH Sheikh Hamdan Bin Mohammed Bin Rashid Al Maktoum, Crown Prince of Dubai and Chairman of the Dubai Sports Council, for his patronage and support of air sports in general and the championship. Revealing details about the event, Al Niyadi said pilots from UAE, Japan, Germany, Switzerland, France, Italy, South Africa and Ecuador will be participating in the event, which has a total prize purse of $70,000 with the winner of each race receiving $7,500. 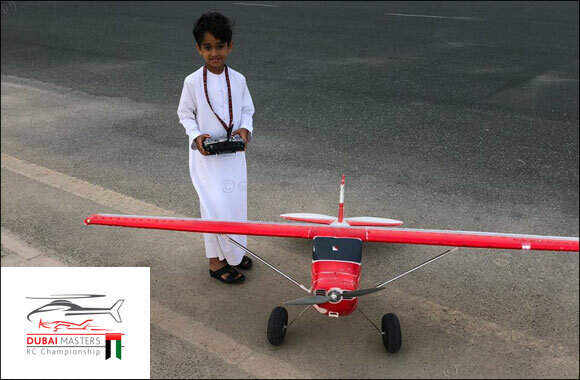 There will be five pilots representing the UAE, including the youngest pilot in the world, Nasser Ahmed Nasser, who is seven years old. The others are Ahmed Nasser, Tamer Awadh Al Shamsi, Abdullah Jassem and Mohammed Dalmouk Al Dhaheri. The event is open and free to the public.